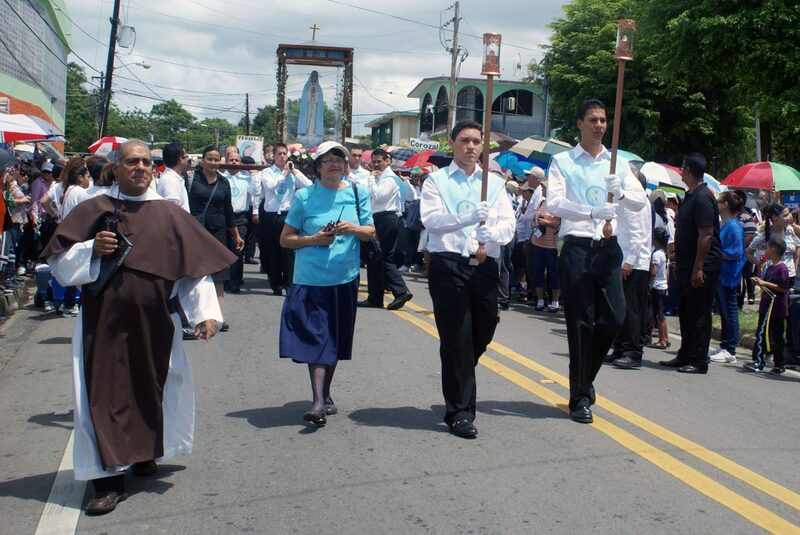 SABANA GRANDE, Puerto Rico — Although followers of a popular devotion centered on Our Lady of the Rosary were cheerfully celebrating being allowed to attend a public Mass, the bishop planning to celebrate the liturgy warned that their practices continue to be unrecognized by the church. The group, calling itself Our Lady of the Rosary of the Spring Devotee Association, announced May 2 that Mayaguez Bishop Alvaro Corrada del Rio was “inviting all devotees of the Virgin of the Spring to a Mass that will make history in Puerto Rico.” The group’s press release suggested the bishop was celebrating Mass May 22 specifically as a prelude to the devotees’ anniversary pilgrimage to the Marian shrine in the Rincon area of this southwestern municipality. The name “Virgin of the Spring” is a popular identifier adopted by devotees after Mary’s supposed apparitions at a spring-puddle in Sabana Grande in 1953. The group maintains that several students from a nearby grade school reported seeing “a beautiful young lady” floating on a cloud above a spring that provided water to the school. The diocese has said that it has not found the apparent visions as supernatural in nature and has advised the faithful to avoid affiliating with the association. Local newspapers published the press release May 4 under headlines suggesting that the Mass was specifically for the devotees and that Bishop Corrada was ending his distance from the group. The headlines spurred a social media outbreak, speculating about a policy change on the church’s part. The Mayaguez Diocese quickly clarified the church’s position regarding the association in an advance copy of a letter from Bishop Corrada to CNS that was read at all Masses the weekend of May 7-8 and published May 9 by El Visitante, newspaper of the Archdiocese of San Juan. He clarified that he will be in Sabana Grande to celebrate the feast of the Holy Trinity. The letter reminded the faithful that there has been no change in the church’s stance regarding the association and its mission and that the 1987 decree dissolving the association remains in force. The bishop also encouraged diocesan and religious order priests not to participate in activities related to the spring and that any priests who celebrates Mass there would be automatically suspended from ministry. The supposed Marian apparitions at the Sabana Grande Spring lasted from April 23 to May 25, 1953. Hundreds of thousands of faithful from across Puerto Rico packed a sugar cane field near the spring. Several people reported miraculous recoveries from serious illnesses and physical handicaps. After two ecclesial investigations — one by the Diocese of Ponce, to which the Sabana Grande parish belonged in 1953, and the other by the Diocese of Mayaguez in 1986 — the results were “uniformly negative” and that reports of the apparitions lacked credibility. The Marian devotion at the spring continued low-key until 1978, when Juan Angel Collado Pinto, one of the children who claimed to see Mary, announced that she had given him a series of messages for the world. At that time, he offered the first message; the most recent, the sixth, was pronounced 2008. By 1980, a group of devotees had formed, with Collado at the helm, drawing people from throughout the island, including high profile figures from the arts, politics and show business. The resulting association legally incorporated in 1985 as Our Lady of the Spring Mission based in San Juan. Ramos told CNS his association has “international juridic personality,” being recognized by several bishops in other countries. Church documents available as public records reveal that the association never received juridic personality from its home diocese. One important problem between the diocese and the devotee association has been the group’s use of several names, including “Association Pro Devotion to the Virgin of the Rosary of the Spring,” an identification they had requested and was denied by the diocese in 1987. The relationship between the church and the association worsened when the group entered into a mega-project, dubbed The Mystical Mount, to build a resort-type center atop a mountain near the spring. Father Acosta, a native of Sabana Grande, said the distortion was part of a “more serious situation, both on the doctrinal and moral aspect.” Eventually, he said, the church determined no sacrament could be celebrated there, and the association could not be recognized as a Catholic organization. The association’s image took another turn down in 2005, when claims of divergent practices — among these physical, psychological and sexual abuse — originally surfaced from former “disciples” of Collado. Father Acosta described as “a complex thing” the tension between the diocese and the devotee association. My grandfather told me the story of the apparition of the Blessed Mother. From his standpoint, he was suffering from hip problems very hard to walk. He was taken to “El Pozo” and was able to see the Blessed Mother stand above a Mango Tree. As was his faith in her, he took some of the leaves from the tree and made a tea. He drank the tea and fell asleep. The next day, he was cured. He had no need of the wheel chair, which he left at “El Pozo”. He cried out to me “why they do not believe”? To what i answered because those entrusted did not obey. I have gone in 3 times and always have felt something as peaceful spiritual experience a “El Pozo”. Sadly those entrusted with the message thought they are more than Jesus’ Church and representatives. Just keep praying for them. I just want to offer a better translation for this devotion: it’s “Virgin of the Well” (“La Virgen del Pozo”) not the “Virgin of the Spring” which in Spanish would be “La Virgen de la Fuente”- which is not how this disapproved apparition is known in Puerto Rico and elsewhere. To those who defend the “international standing” of the apparition’s “recognition”, they would do better if they had their facts straight. Recognition comes from the local ordinary, not from other bishops far away. That’s how it works, their protestations notwithstanding. The apparition is not approved. Obey the bishop! Move on. this is a true apparition.. there were real cures and healing… it will survive! I was 8 years old when the apparitions were reported in the newspapers. The last day, after flooding rain, the sun came out and turning towards the people, just like in Fatima. Everything dried up. Many miracles happened with the water that came out of the spring from the earth like the Virgin promised. Doctors described them as such. All this has been reported in the “el Imparcial and el Mundo” newspapers of that time. I understand that men have spoiled what heaven so mercifully gave us. The verifiable truth is one, but obedience goes above everything.